The Miller’s House Museum is dedicated to interpreting the industrial & transportation history of the Lexington area by celebrating the roads, rivers and rails that served a now extinct industrial complex on Jordan’s Point. A diorama portrays the Lexington railroad system. 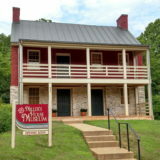 The Miller’s House, built in the early 1800s, is the only remaining structure at this once vibrant area developed by John Jordan, who operated a furnace, a forge and the covered toll bridge that spanned the North (Maury) River. Open Saturdays and Sundays 1pm - 4pm. Special tours and school groups by appointment.